1. Avoid contact with liquid. 2. Wrap dry after use and store in the cool dry place. 3. Contain small parts. NOT for child under 10 years old. 4. This CZ earrings set in 5 size 3,4,5,6,7mm diameter will meet all your weekly earrings matching need, just enjoy the mix match fun and shine brighter than ever with them. 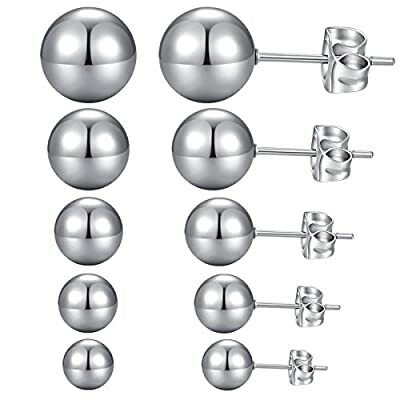 * Color: Silver * Material: Stainless Steel Ball * Size: 5 pair (3mm/0.12",4mm/0.16",5mm/0.2",6mm/0.24",7mm/0.28") * Weight: 8.5g * Surgical Stainless Steel, perfect polishing, hypoallergenic and nickle free, good for sensitive ear, comfortable to wear, no fading, irritation or infection.